Amazon is here with a great deal offering Skykitchen 3 Layer Plastic Fruit & Vegetable Basket (Green) at Rs 409. 3-Layer Storage Rack with Wheels help to store . It is made of durable plastic material, which is easy to clean. . Grab Now..!! 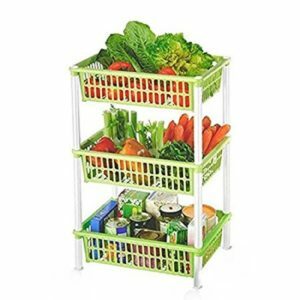 How to Buy Skykitchen 3 Layer Plastic Fruit & Vegetable Basket (Green) at Rs 409? Place one of the trays inverted (Upside down)on a strong surface and fixate the four connecting plastic pipes on the corners of the tray. Now place one more tray on those plastic pipes and fixate connecting pipes in the same way as before. Repeat the process one more time. Now fixate the connecting pipes and then add the wheels to it. Add the caps to fixate the wheels firmly with the connecting pipes.